From the outset of her career, the work of PJ Harvey has commanded attention. A multi-instrumentalist, she is primarily a vocalist, guitarist and pianist, while also an accomplished player of the autoharp. In 1991, Harvey formed the eponymous bass/drums/guitar trio in Dorset, England and by that autumn had released the debut single ‘Dress’ on independent label, Too Pure. Dry, released March 1992, was hailed globally as an astonishing debut album, particularly in the United States, where Rolling Stone magazine named Harvey ‘Best Songwriter’ and ‘Best New Female Singer’ of 1992. In 1993, she signed to Island Records and released her second album Rid Of Me. The album, supported by a lengthy world tour, garnered Harvey her first Mercury Music Prize nomination. The original trio dissolved and Harvey’s solo follow-up, 4-Track Demos was released in the autumn of 1993. To Bring You My Love, an eclectic and starkly original album followed in 1995, and was accompanied by live performances that saw Harvey explore a more theatrical edge on stage. She received her second Mercury Music Prize nomination, two Grammy Award nominations, and ‘Artist of the Year’ awards from both Rolling Stone and Spin. Her fourth album Is This Desire? released in September 1998, attracted plaudits globally, gaining several BRIT and Grammy Award nominations. The much anticipated follow up, Stories From The City, Stories From The Sea, was released in October 2000 and went on to win Harvey’s first Mercury Music Prize. ‘Stories…’ was supported by a sold-out worldwide tour. After a summer of live dates, including the first rock concert to be held at London’s Tate Modern gallery, Harvey finished work on her next album, Uh Huh Her. White Chalk was her critically-acclaimed seventh studio album, which marked a departure as it was composed almost entirely on piano. It was supported by a string of notable solo performances including Manchester International Festival, The Royal Festival Hall, the Hay-On-Wye Festival of Literature, the New Yorker Festival, Sydney Opera House and a performance at Copenhagen Opera House for the Crown Prince couple. In 2006 PJ Harvey: The Peel Sessions was released – a collection of recordings for the veteran British broadcaster John Peel, spanning her career to date. Harvey’s 2011 album, Let England Shake, was created with a cast of musicians and long-standing collaborators Flood, John Parish, and Mick Harvey. The songs focus on both her home country and events further afield in which it has embroiled itself. The record evokes the troubled spirit of its time, whilst also looking back through our history. Let England Shake won Harvey her second Mercury Music Prize, setting her apart as the only artist to have won the award on two occasions, an achievement recognised by The Guinness Book Of Records. The album was also awarded ‘Album of the Year’ at the 2012 Ivor Novello Awards and was named ‘#1 Album of the Year’ by numerous publications including The Sunday Times, Los Angeles Times, Mojo, Uncut, Washington Post, The Guardian, NME, Spin, Sydney Morning Herald, Le Matin, OOR Magazine, Irish Times, The Independent, and The Sunday Telegraph. Prior to the album’s release, in May 2010, Harvey made a guest appearance on BBC1’s Andrew Marr Show, the week before the UK General Election. She was interviewed by Marr and performed the song ‘Let England Shake’ in front of Marr’s other guest, the then Prime Minister, Gordon Brown. She was invited back on the show in April 2011 alongside Brown’s successor, Prime Minister David Cameron, and performed the song ‘The Last Living Rose’. Let England Shake was accompanied by 12 short films by award-winning photojournalist Seamus Murphy. Murphy, with whom Harvey began working in 2011, has spent over two decades documenting the world through his lens. His work has taken him to Rwanda, Eritrea, Kosovo, Iran, Afghanistan, Iraq and Syria. Harvey’s work with Murphy continued over subsequent years, with the pair accompanying each other on trips to Kosovo, Afghanistan, and Washington D.C. This unique artistic, journalistic and photographic journey became Harvey’s ninth studio album, The Hope Six Demolition Project. In early 2015, the album was recorded during a month-long and groundbreaking residency, called ‘Recording in Progress’ at London’s Somerset House, during which audiences were given the opportunity to observe Harvey at work with her band and producers in a purpose-built studio housed in the basement of the iconic London building. The Hope Six Demolition Project was released in April 2016 and became Harvey’s first UK number 1 album. 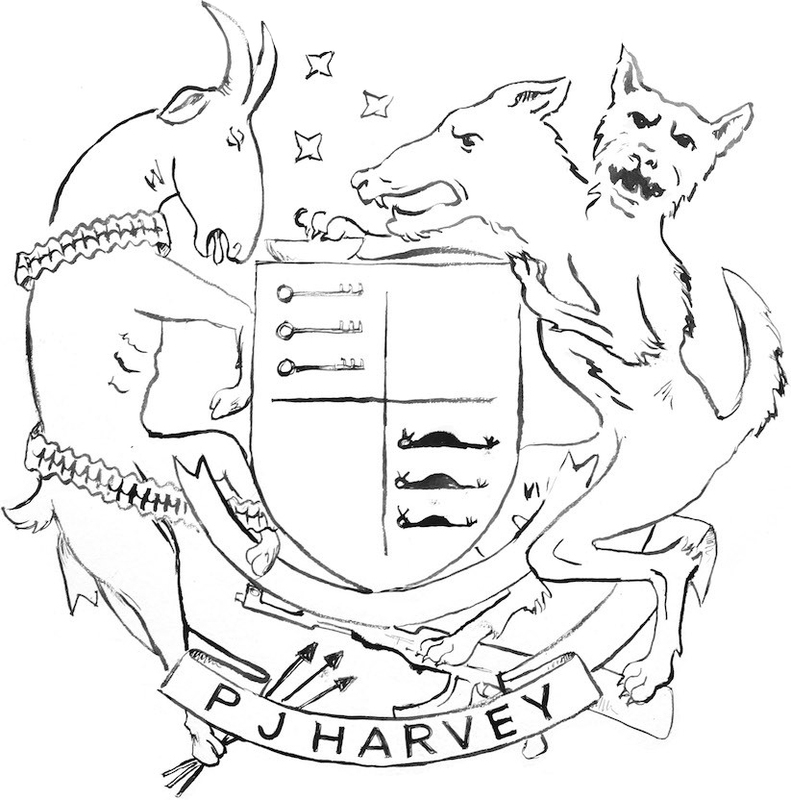 PJ Harvey has collaborated with a wide range of musicians, including Thom Yorke, Nick Cave, Tricky, Sparklehorse, Josh Homme, Josh Parish, Pascal Comelade, Gordon Gano, Ramy Essam and Mark Lanegan. She also wrote, recorded & produced material for Marianne Faithfull’s 2004 album ‘Before The Poison’. In 1996 she worked with John Parish on Dance Hall At Louse Point, both an album and a live accompaniment to the Mark Bruce Dance Company production of the same name. The follow-up collaboration with Parish, entitled A Woman A Man Walked By, was released in 2009 ahead of an extensive tour of Europe and America. The video for the first single, ‘Black Hearted Love’, was directed by the acclaimed British artists Jake & Dinos Chapman. Her work with photographer Seamus Murphy has seen them collaborate on two albums: Let England Shake and The Hope Six Demolition Project, as well as Harvey’s debut book of poems, The Hollow of the Hand and the feature-length documentary A Dog Called Money. Harvey has composed extensive soundtracks for film and television, in 1994, covering ‘The Ballad of the Soldier’s Wife’ for the documentary ‘September Songs: The Music of Kurt Weill’, and in 1996, contributing ‘This Is Mine’ with Nick Bicât for Coky Giedroyc’s film, ‘Stella Does Tricks’ and ‘Who Will Love Me Now’, again with Bicât for Philip Ridley’s ‘The Passion of Darkly Noon’. In 2009, Harvey composed the soundtrack for renowned director Ian Rickson’s New York production of ‘Hedda Gabler’. They worked together again in 2011 on the music for Ophelia in ‘Hamlet’ at the Young Vic, starring Michael Sheen, and for his highly acclaimed 2014 production of ‘Electra’ at The Old Vic starring Kristin Scott Thomas. She also scored Rickson’s “The Nest,” as well as “The Goat” starring Damian Lewis. In 2019, Harvey was commissioned to score Ivo Van Hove’s West End production of ‘All About Eve,’ starring Gillian Anderson and Lily James. Her artistic process on this and previous scores was documented by BBC Radio 4 journalist Jon Wilson, as part of the BBC’s highly respected ‘Behind-the-Scenes’ series. Harvey contributed original music for the BBC’s ‘Peaky Blinders’ Series 2, starring Cillian Murphy, and the radio drama productions, ‘Eurydice and Orpheus’ by Simon Armitage and ‘Orpheus and Eurydice’ by Linda Marshall Griffiths. Other projects have included soundtrack work on the films ‘Basquiat’ by Julian Schnabel, ‘The Cradle Will Rock’ by Tim Robbins, ‘What’s This Film Called Love’ by Mark Cousins, Sarah Miles’ ‘Amaeru Fallout 1972’, ‘Dark River’ by Clio Barnard, and ‘Six Feet Under’. Her tracks, ‘Horses’ and ‘Bobby Don’t Steal’ featured in Mark Cousins’ 2012 film, ‘What’s This Film Called Love’. Original music by Harvey features in Shane Meadows’ 2019 series, ‘The Virtues’. As an actor, Harvey appeared in the 1990 film, ‘Lost in the Stars’ and as Mary Magdalene in Hal Hartley’s movie ‘The Book of Life’ in 1998. She also had a cameo appearance in Sarah Miles’ 1999 film, ‘A Bunny Girl’s Tale’. In addition to her musical career, Harvey paints, draws and creates sculptures. Summer 2010 saw Harvey guest design Francis Ford Coppola’s art & literary magazine; Zoetrope: All-Story. The issue featured her previously unseen paintings, sculpture and drawings. She contributed artwork to Beat Magazine in 2015 and a photo montage she created appeared in Vogue Australia in 2016. She continues to paint and draw, and her latest work will appear in her new poetry collection. In August 2013, PJ Harvey released the song, ‘Shaker Aamer’, to highlight the detention of the then last British resident held without trial inside the US prison at Guantánamo Bay. The track was streamed exclusively on The Guardian’s website and received positive worldwide attention. Aamer was eventually released two years later in October 2015. In June 2017, PJ Harvey collaborated with Egyptian recording artist Ramy Essam, and producer John Parish, to write and record ‘The Camp.’ The song was created to raise awareness and funding for The Beyond Association, a national Lebanese NGO. Beyond’s work provides access to education, healthcare, and psycho-social support for displaced children in the Beqaa Valley of Lebanon. In 2008, Harvey appeared on ‘Private Passions’ on Radio 3. She was a guest editor on BBC Radio 4’s Today Programme in December 2013, and in 2017, Radio 4 broadcasted a 15-minute drama, ‘On Kosovo Field’, inspired by PJ Harvey’s notebooks and poetry from her travels in Kosovo, written by Fin Kennedy. PJ Harvey’s first collection of poetry titled The Hollow of the Hand, in collaboration with photographer Seamus Murphy, was published by Bloomsbury UK in October 2015. To celebrate the release, Harvey and Murphy presented The Hollow of the Hand – two sold-out live events of poems, new songs, images and conversation at the Royal Festival Hall – as part of the London Literature Festival. Her poem, The Guest Room, was first published in The New Yorker in 2015. She continues to study poetry and is currently writing her second collection. On 4th November 2015, PJ Harvey appeared alongside Irish poet Paul Muldoon in a new experimental series of ‘In Conversation’ style evenings called ‘Soundings at the Byre’, created by the University of St. Andrews’ new International Writer in Residence, Reif Larsen, and Professor of English, Don Paterson. In 2013, Harvey was awarded an MBE for services to music. The following year, she was awarded an Honorary Degree in Music by Goldsmiths University. She has been nominated for several Grammy Awards and is the only artist in history to have won the Mercury Music Prize twice.